Jordan Burgess has connected on 50% of this three-point attempts over his first three games and has even played center on two occasions. The Rams find themselves in paradise this week, getting set for a Battle 4 Atlantis tournament in the Bahamas that with a few wins could set VCU for an incredible season. But November neutral-court tournaments have not been kind to the Rams over the past few years and the black and gold’s vacation could turn into a nightmare if they aren’t ready to play against a loaded field. The Bears once again bring a talented team into the DI hoops season, jumping out to a 3-0 start including a win over Oregon, as well as a top-100 kenpom win over a “Dunk City” Florida Gulf Coast featuring former VCU big, Antravious Simmons. Scott Drew’s team lost skilled 6’8 baller Taureen Prince to the first round of this year’s NBA Draft as well as 6’8 278 monster, Rico Gathers, but have flexed their depth from last year’s team by seeing jumps from now-juniors Johnathan Motley (6’10 230), Terry Maston (6’8 230) and 7′ shot-blocking sensation, Jo Lual-Acuil. In short, the Bears are loaded and look poised to dance once again. The Bears have climbed their way to 25th nationally in kenpom’s computer rankings and check in at No.20 in the AP Poll. Baylor has scored well both inside and outside of the arc this season and have been almost as equally impressive on the defensive end. Four Bears are averaging double-digits points this early in the season, headlined by Miami transfer guard, Manu Lecomte at 16.7 points per game. The Bears have been accurate from deep early but do the majority of their work inside the arc and have been extremely effective at getting to the free throw stripe for easy points. Long story short, today’s matchup could quite possibly be the biggest challenge on VCU’s schedule this season, a team solid in virtually every aspect of the game and one with a legit shot to win this year’s Battle 4 Atlantis if they can get past our VCU Rams today. VCU flashed just how dangerous they can be this season with their 39-point win against Binghamton. While the Rams have been very strong on defense in their first three games, the offense didn’t exactly keep pace up until this past Friday. What happened then was an offensive explosion that should worry Atlantic 10 teams, seeing VCU connect on 56.4% of their attempts including a red-hot 55% of their 20 three-balls that evening. If VCU hits shots they become deadly, already boasting the nation’s 18th-ranked defense (as of this post). Another key in the Rams recent win was a lack of turnovers that had haunted them previously. 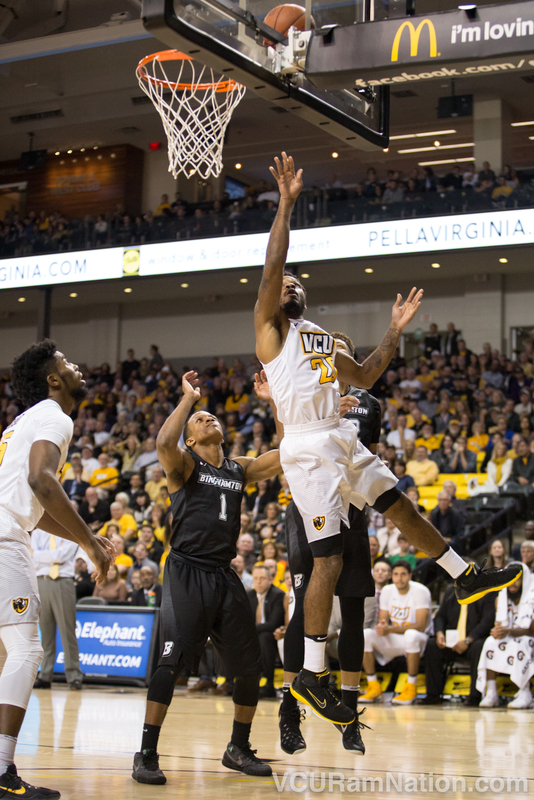 The Rams 22% offensive turnover percentage ranks an abysmal 281st nationally but there may be reason for optimism following VCU’s improved 12-turnover performance against Binghamton. An improved offensive performance, like in VCU’s win against Binghamton, will go a long way against Baylor today. Another thing that makes VCU perhaps deadlier than they’ve appeared this season is the ability to Mo Alie-Cox and JeQuan Lewis to break out of their early season shells. The Rams are off to a 3-0 start despite seeing seniors Lewis and Alie-Cox each average under 11 points. Both are capable of much more so don’t be surprised if either goes off today. VCU has played three consecutive games of great defense. Their ability to find that type consistency on offense will ultimately determine their ability to beat teams like Baylor. The Rams have been good as finishing inside the arc all season long but a solid night from three and a turnover total of 12 or fewer could set VCU up for a nice run through the Bahamas and VCU fans up for a happy start to our Thanksgiving break. Baylor is an interesting matchup for VCU in that they are 1) the most talented team VCU will have played but also 2) the type of team VCU has typically matched up well against. The Rams have faired better against teams that rely on a traditional lineup of two bigs down low versus teams that prefer small ball. In theory that’s a good start for VCU but it feels odd saying that about a team as talented as Baylor. I think ultimately as impressive as Baylor is in the paint it’s their ability to get their guards going that will decide this game. If Baylor can turn VCU over like opponents have in three of their four games (that includes a VCU exhibition loss to DII Queens University) and limit the Rams from deep things could get out of hand for the black and gold while creating a smooth path to a B4A semi-final matchup for the Bears. Kenpom: 67-69 VCU loss with a 45% chance of a Rams victory. Watch: ESPN2, Official game day headquarters are Buffalo Wild Wings locations at Virginia Center and downtown on Cary Street in Shockoe Bottom.